Find a lower price & we'll match it! View all of your data from any location using the free Netatmo app. If you don’t have a smartphone or tablet, you can access all your data from your computer using Netatmo’s Web app. You can now measure wind speed and wind direction with the Netatmo Wind Gauge. The first ultrasound wind gauge of its type: the 4 ultrasonic transducers provide ultra accurate measurements and will save your from doing any maintenance after installation. Place the Wind Gauge outside - it communicates directly with your Weather Station. You enjoy flying drones with your kid? The Wind Gauge gives you wind strength and direction measurements so you know exactly when it’s the best time to go out. You will never miss a good moment with your family. The Netatmo Wind Gauge only works with the Netatmo Weather Station, sold separately. 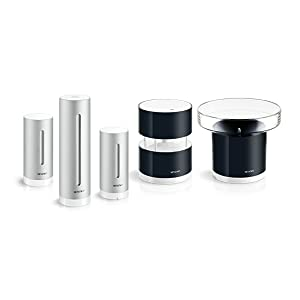 Get essential information for your comfort with the Netatmo Weather Station and accessories. 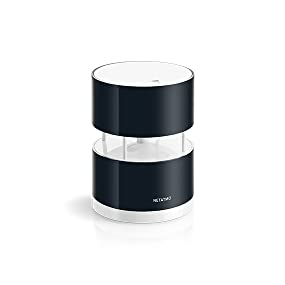 You can also use the Netatmo Rain Gauge to measure the amount of precipitation at your home, and the Additional Module for Netatmo Weather Station to monitor the indoor environment in each room. Range: 0 to 45 m/s (160 km/h, 100 mph). Accuracy: 0.5 m/s (1.8 km/h, 1 mph). m / km / mph / mm / inches / g / lb. Wireless connection between Module: long range 100 m / 330 ft.
Wind Gauge powered by 4 AA batteries. Record frequency with the Indoor Module: every 5 minutes. Use Weather App and webapp. The Wind Gauge only works with the Netatmo Personal Weather Station, sold separately. - iOS 9 minimum required for iPhone and iPad. - Android 4.2 minimum required. - Windows Phone 8.0 minimum required. Copyright © 2013 Scientific Sales, Inc..